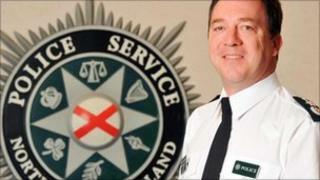 A cross-border policing strategy has been launched by the police services in Northern Ireland and the Irish Republic. It identifies a number of work areas where they feel co-operation and legislation can become stronger. These include reviewing the effectiveness of intelligence-sharing and establishing a joint tasking and co-ordination group. The PSNI and Irish police said there was "no room for complacency". In a joint statement, PSNI chief constable Matt Baggott and Garda commissioner Fachtna Murphy said: "In recent months, through sharing information and intelligence, and by putting in place joint policing operations, many instances of terrorism, serious and organised crime and local crime have been prevented. "This has, undoubtedly saved lives, while ensuring those involved in such activity are identified and brought to justice. "Terrorism, serious and organised crime, and local crime strike fear into the heart of communities and know no boundaries. "It is therefore increasingly important that law enforcement agencies work in partnership to achieve the shared objective of keeping all of our communities safe." Earlier this month, a mortar bomb primed to be used for an attack in Northern Ireland was seized by police in Dundalk in the Irish Republic. Senior Irish police officers said they were satisfied they had foiled an attack by republican dissidents, Oglaigh na hEireann. Northern Ireland Justice Minister David Ford said the co-operation that existed between the PSNI and the Irish police was "stronger than ever". "However, determined not to rest on their laurels, the publication of this strategy reinforces their commitment to ensuring that policing co-operation on both sides of the border continues to operate at the highest level," he added. Irish justice minister Dermot Ahern also welcomed the initiative. "Those of us who hail from the border area understand better than most the importance of ensuring that the border does not present a barrier to the wellbeing and quality of life of those who reside on either side," he said.